South Korean artist Park Seo-Bo is credited with creating Korean modernism by embodying East Asian views of nature and art in his monochrome paintings. He delves into questions of what painting is, such as “Why paint?” and “How to paint?” in connection with contemporary society, often modifying his technique and presenting a new model of Korean painting. In his Ecriture series, French for ‘writing’ or ‘inscribing,’ he takes up a way of painting that is akin to the exercise of writing. Over the course of his long career, Park has experimented with different materials and techniques. While the initial works from the Ecriture series in the early 1970s largely featured lines drawn repeatedly in pencil on a painted surface, those presented in this exhibition maintain the formal elements that appear in his works since the 1980s, when he began using hanji, the traditional handmade paper from Korea. This recent body of work recalls the linear hanji works from the Ecriture series, but here, he layers wet hanji onto the canvas, repeatedly pushing a stick along the paper so that parallel lines are arranged over the canvas in a strict order. Unlike the previous pencil Ecriture works completed by improvisational drawings or the earlier hanji works whose compositions were constructed by pushing out the paper in a zig-zag pattern, now the canvas is executed in a precisely planned way. By handmaking the work’s base layer of hanji through repetitive motions, the artist turns it into both a support and a surface, a field where his actions and the materiality of paper become one. It reveals the trajectory of the artist’s activities, the process of working, and the accumulation of time. This endless repetition, free from all ideas and thoughts, leads to the self-discipline and solitude which reflect the Korean view that one can only receive nature fully by emptying the self. In previous periods, Park used color to interpolate specific subjects into his works: the wounded souls from the post-war era were represented by the dominant use of black in his informal-style Primodial series; to represent the national or people’s culture, he used obangsaek, or the traditional Korean color spectrum in his Hereditarius series; or simply to not give much weight to color, he chose a white in his pencil for the Ecriture period. In other instances, as a way of coming closer to nature, the artist used water-soluble pigments, as in the early hanji Ecriture works. This means that for Park, color is a vehicle to show the sign of the times, a thesis for modernizing tradition and a symbol to show a unique identity. Through their use of color, these works are closely connected to the social and cultural contexts in which they emerged. However, since the 2000s, the artist began to focus on the beauty of the painting itself and more moderate colors, more than in any other period. The paintings shown in this exhibition, works from the 2000s, are characterized by bright, vivid colors. These compositions with complementary colors in their vertical furrows have different effects according to different points of view as in Op Art. 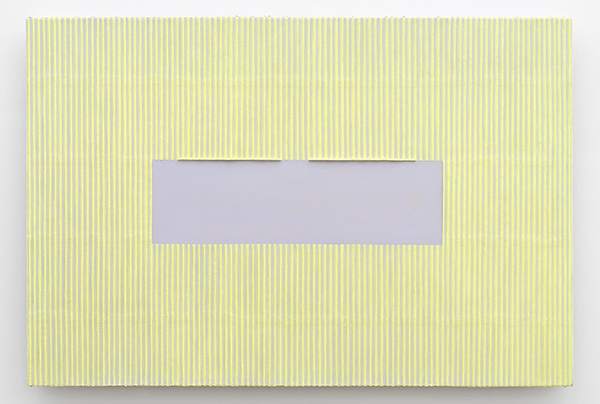 However, unlike Op art, whose optical illusions are highly calculated, Park’s paintings look natural rather than mechanical, soft rather than sharp. This is why viewers often find themselves spending long periods of time in front of Park’s works, captivated by their restraint and refinement. As we contemplate the paintings in this exhibition and become immersed in them, let us reflect on Park’s wish that a painting will be able to give comfort and rest to the wounded, modern human in this digitalized world. They also offer new answers to the questions “Why paint?” and “How to paint?”, answers he has searched for throughout his life. Park Seo-Bo (b. 1931, Yecheon, Korea) is an eminent figure in contemporary Korean art. He has exhibited internationally at the Leeum, Samsung Museum of Art, Seoul; Busan Museum of Art, South Korea; Tate Liverpool, UK and the Brooklyn Museum, New York, among other leading institutions. His works are in several important collections, including the DIA Art Foundation in the United States; the Guggenheim Museums in New York and Abu Dhabi; The Museum of Modern Art, New York; The Art Institute of Chicago; and the Hirshhorn Museum and Sculpture Garden, Washington, DC. Park will have a solo show at the National Museum of Modern and Contemporary Art, Seoul in May 2019.